Agile Apple TV Video Converter is a useful video software in converting video to Apple TV Video (MP4).It converts video files of any format such as AVI, MPEG, MPG, WMV, Xvid, VidX, ASF, MOV, VOB, ect to Apple TV compatible formats and play them on your Apple TV with excellent image/sound quality.Batch conversion function allows you convert multiple files at the same time. It saves you time and is very convenient. ...... Batch conversion function allows you convert multiple files at the same time. It saves you time and is very convenient.Anyway, as a Apple TV Video (MP4) converter, Agile Apple TV Video Converter is the best choice! Qweas is providing links to Agile Apple TV Video Converter 2.3.1 as a courtesy, and makes no representations regarding Agile Apple TV Video Converter or any other applications or any information related thereto. Any questions, complaints or claims regarding this application Agile Apple TV Video Converter 2.3.1 must be directed to the appropriate software vendor. 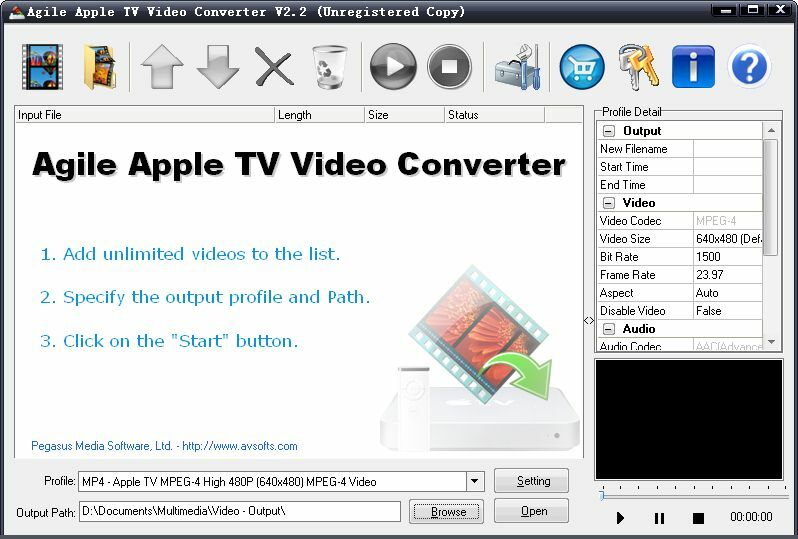 You may click the publisher link of Agile Apple TV Video Converter on the top of this page to get more details about the vendor.